That William Pettypool survived the harsh conditions of the 17th century east London suburbs and the early colonial Chesapeake is testimony to his personal resilience. None could have foreseen that William would become the American progenitor of thousands of descendants. The circumstances of his birth certainly would not have suggested much chance of success. Christened on 20 October 1630 at St. Dunstan’s Church in the village of Stepney, William Pettypool was born to Samuel and Alice (Jackson) Pettypool. Samuel declared himself a “cordwinder” (shoemaker) when he applied for a license1 on 7 August 1627 to marry Alice. Samuel’s occupation and the location of his residence indicate social standing of the lesser sort and likely an accompanying intermittent if not chronic poverty. Alice gave birth to seven known children2 between 1628 and 1637, two before William and four after. With the exception of William and a daughter, Mary, the last child christened, all died within two years of birth. From all indications William was the last male in England to be given the Pettypool surname. 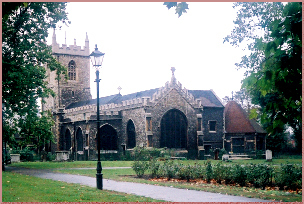 St. Dunstan’s, Stepney, is the church where Samuel and Alice (Jackson) Pettypool were married and where their children, including the American immigrant, William Pettypool, were christened. Although the church occupies a site continuously used for Christian worship for over a thousand years, the building in its current form was completed mainly in the 15th century, some 200 years before William was brought here by his parents to be christened in October of 1630. St. Dunstan’s served villages east of London along the Thames River. Village inhabitants traditionally found occupations associated with seafaring, including shipbuilding and the provisioning trades. William probably knew these areas well and likely set sail for Virginia from one of the docks along this part of the Thames River. Photographs of St. Dunstan's can be found on the Maps & Photos page. After laboring in Virginia for an estimated five to seven years, William was released from his indenture in 1660. Upon his release William married Ann Smith, also an indentured servant, and undoubtedly attempted to join his peers in growing tobacco, cornerstone of the colonial Chesapeake economy. Last mentions of William in Chesapeake records occurred in Maryland, beginning in 1665 when William, Ann, and their minor son, also called William, received free land from the owners of Maryland colony, such land offered as an inducement to lure settlers there. Although previously obtained records failed to definitively identify William’s place of death, two pieces of recent evidence from Maryland sources do suggest that William continued to reside in Maryland until his death at age 38 in late 1668. In a court record4 dated 11 August 1667 “William Pettipoole” is listed as one of the debtors in the probate inventory of a “Capt. William Smith”, and in a land patent exchange5 recorded 5 November 1668, William received a warrant for 100 acres of land in St. Mary’s County, Maryland. Although his life was short by today’s standards, William Pettypool accomplished for himself and his family what he never could have achieved in England of this period: ownership of land with its attendant rights and privileges. Child of William and Ann Smith Pettypool: William. For a detailed documentary account of William Pettypool’s activities between his arrival in America and his death, see : The William Pettypool Family of Southside Virginia: Lineage Reconstruction Based on Current Review of Evidence, The Virginia Genealogist, Vol. 4, No. 1 (January-March, 2003) by Carolyn S. Hartsough, Ph.D. The full text of that article is available for download. 1. Thomas Colyer Fergusson (ed. ), Middlesex County – The Registers of St. Dunstan’s, Stepney, Marriages 1568-1639 (Canterbury: Cross and Jackson, 1898), 171. 2. Computer print-out of St. Dunstan’s Stepney, London, England 1621-1641 Births and Christenings A-Z, Batch #C 5576-6 (1978): 649-650, microfilm 1,238,617, Family History Library, Salt Lake City, Utah. 3. Nell Marion Nugent, Cavaliers and Pioneers: Abstracts of Virginia Land Patents and Grants, 1632-1666 (Richmond, 1934; reprint, Baltimore, 1963) 386, index, 712. 4. V. L. Skinner, Jr., Abstracts of the Testamentary Proceedings of the Prerogative Court of Maryland, Volume I: 1658-1674, Libers 1A, 1B, 1C, 1D, 1E, 1F, 2, 3, 4A, 4B, 4C (Baltimore, Maryland: Genealogical Publishing Co., Inc., 2004), 150. 5. Volume 13, Patents Liber 11, p. 543 (Hall of Records, Annapolis, MD); land patent cited by Rhonda Shoemaker in “Delilah Gadd,” listserve message to Gadd Genealogy Forum, http://genforum.genealogy.com/gadd/messages/644.html>,1 August 2009. Citation corrected 9 October 2014 by Lou Poole who notes additionally: "According to Skordas, this was copied/transcribed in 1725 from Liber GG (1667-68), folios 70-548.